Pretty cool! I had no idea that this technology was being applied in this way. Curious if this is just a tiny experiment, or if this kind of display is rolling out at a larger scale already. E ink totally makes sense as a way to roll out more dynamic (networked) announcement boards across the city at a lower energy cost. One of my co-workers remarked that there’s a conspicuous lack of ad space on the display. 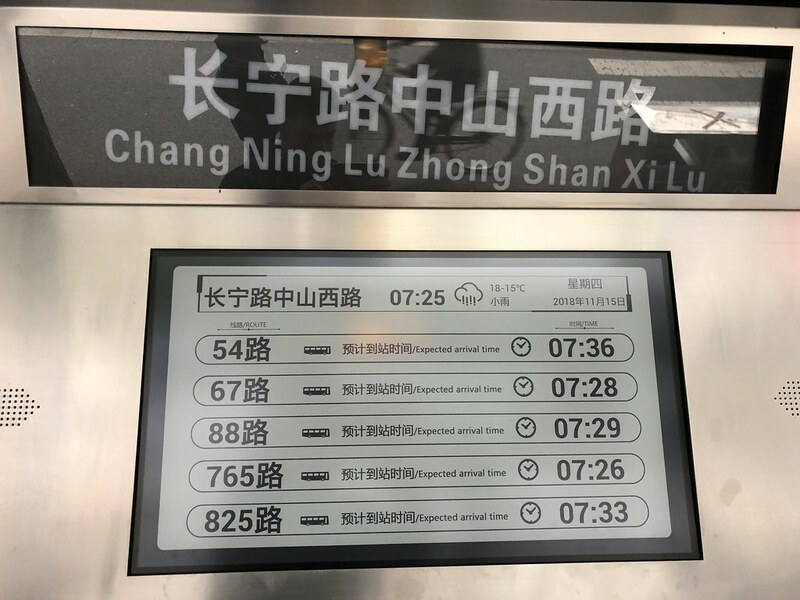 Other similar bus stop displays have used conventional monitors to show the bus ever-changing schedule alongside video ads. This does seem like a user-friendly lower-cost option, though. I studied abroad in Japan for the 1997-98 academic year. During spring break, a friend and I hitchhiked from Osaka to Fukuoka. We visited from friends of mine, and explored the northern half of the island of Kyushu. Now, just over 20 years later, I’ve just visited Fukuoka again. This time the differences I noticed felt meaningful, and it’s not because of Japan. It’s because of me, and the 18 years I’ve spent in China in the meantime. Obviously, this is a personal take. So-called “evidence” I cite is anecdotal. It doesn’t take into account the societies as a whole. I know, Fukuoka is not Tokyo. But if you can handle all that, read on. The overwhelming sense I got which took hold of me early on in the visit and just wouldn’t let go is that Japan hasn’t changed much in 20 years. Of course it’s changed. But having lived in China, where pace of development permanently stuck in “breakneck speed,” Fukuoka really made me feel like Japan’s development is at a standstill. I’m no economist, but I’m into technology, so that’s one of the areas I was constantly checking up on. Remember when Japan felt super high-tech, back in the 80’s and 90’s? Now it feels kind of like Disney’s Epcot center, the “city of the future” conceived of in the 1970’s. Vending machines everywhere. This is one of the things that’s so Japan, and I take no issue with the approach, except that these are literally the exact same machines from 20 years ago. They really haven’t changed. 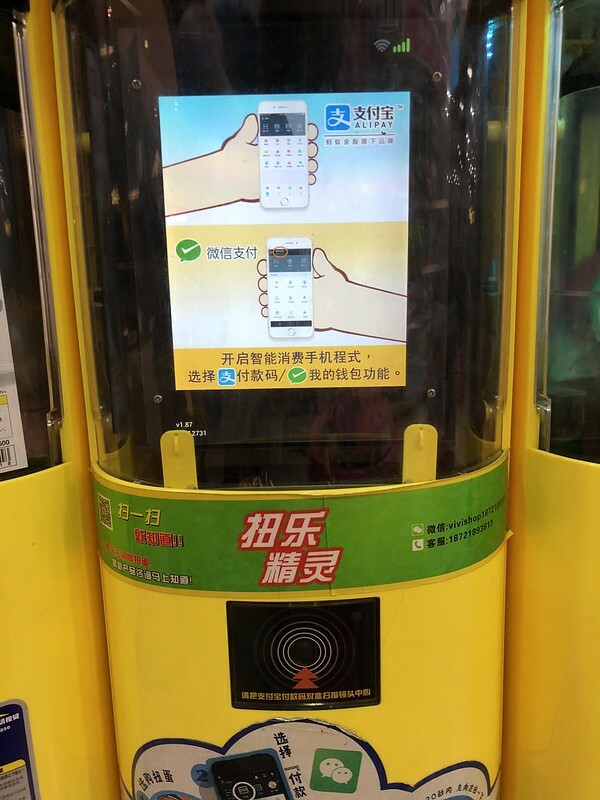 Meanwhile, China is outfitting these machines with scanners to support WeChat and AliPay. 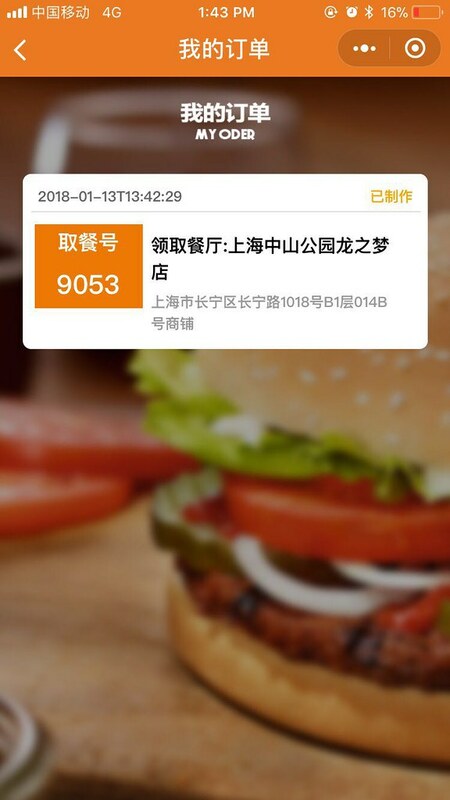 “Cashless” restaurant ordering also means vending machines. My wife’s mind was blown that so many Japanese restaurants use meal ticket vending machines. This way the staff doesn’t have to handle money at all, and no one has to take orders. Makes sense, right? 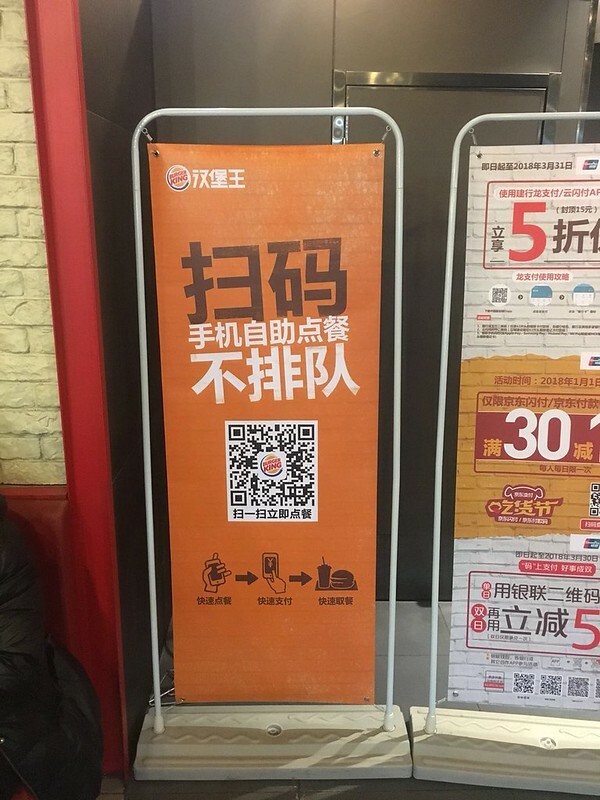 The modern Chinese solution, though, is to just put QR codes on the restaurant tables. 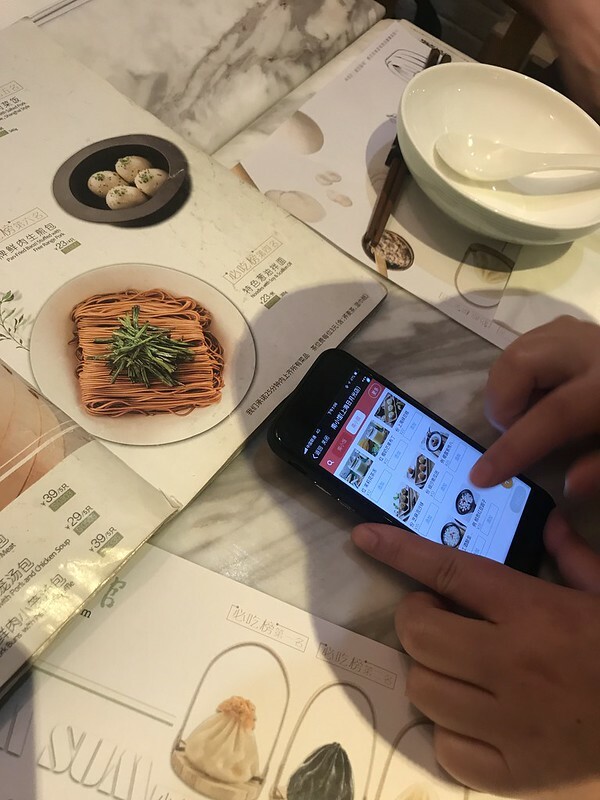 Diners scan, order, and pay right away. The restaurant staff knows which table you ordered from. You barely have to talk to the staff, much less give them a ticket. No cash, no paper, no human interaction necessary. Cold efficiency. Japan’s rail system is still legendary. Again, exactly the same as 20 years ago. You buy train tickets from vending machines. There’s a very real sense of “if it ain’t broke, don’t fix it,” and I can understand that. The train system works so well! It’s easy to use, and the trains all run on time. 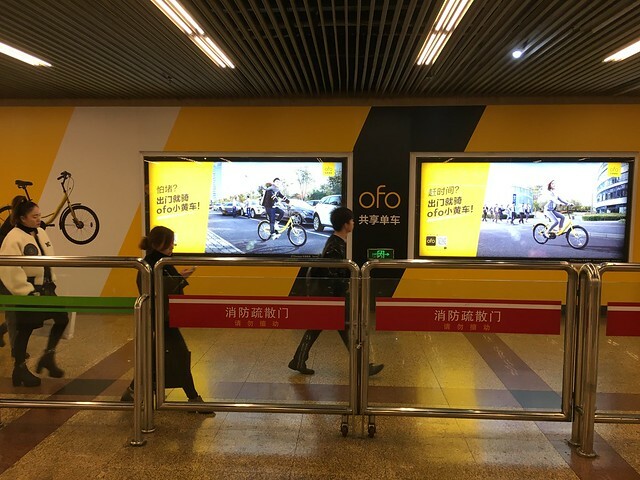 Shanghai’s subway and light rail system is not better than Fukuoka’s. And yet, there’s this feeling that in 10 more years (if that), Shanghai’s will be clearly superior, and Fukuoka’s will be the same. 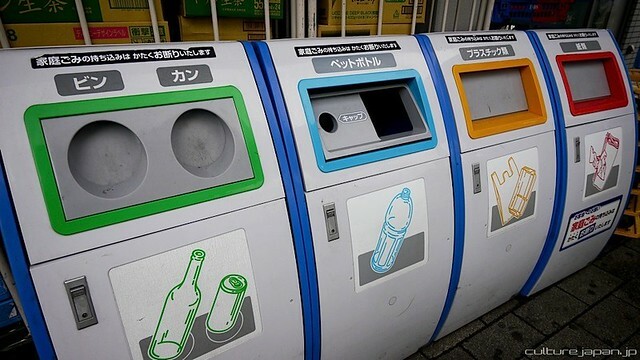 Japan’s still doing great with recycling and environmental protection. I know, Japan still kills whales and does other bad things. 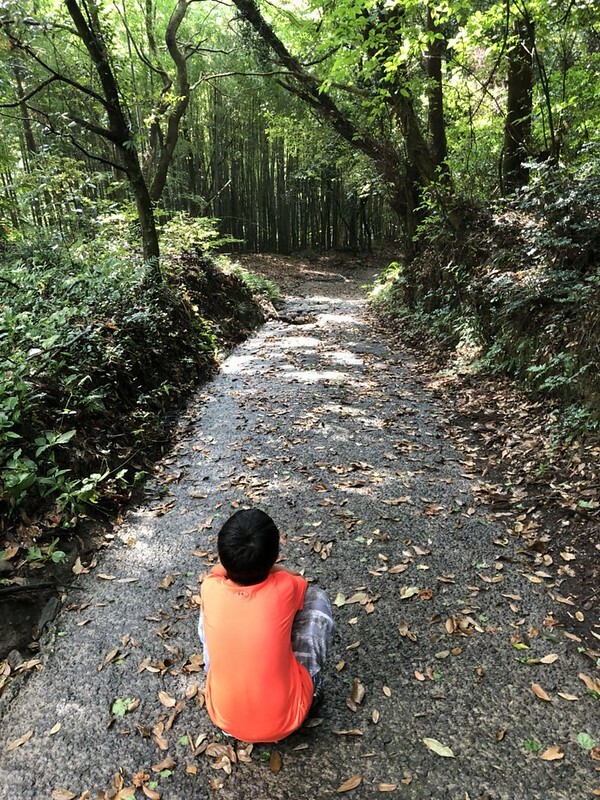 But in general Japan is great at recycling, the streets are clean, and a retreat into the mountains (also clean and relatively unsullied) is never far away. I’m not sure if it’s possible, but it would be so great if China could catch up in this respect. It’s not hard to be alone in Japan. Sure, the cities are super crowded, and apartments are small. But if you need to get away from it all, it feels way easier in Japan. You can hop on a train or bus, and a short ride later be headed into the mountains where you’ll be totally alone. 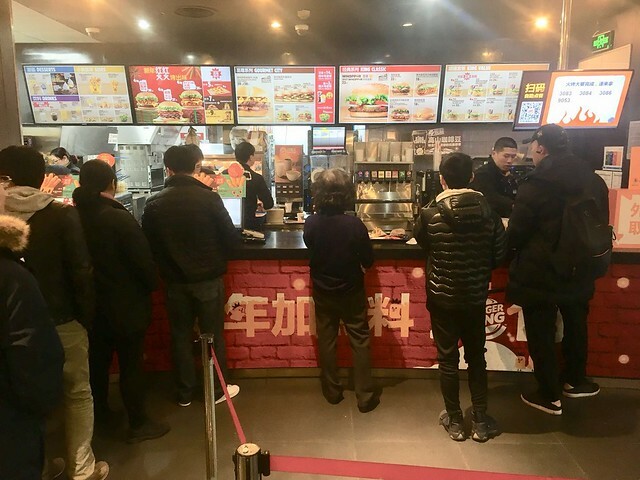 Sure, it’s possible in China, but harder. I could say a lot of these same things about China and the US, especially if I cherry-pick my cities. 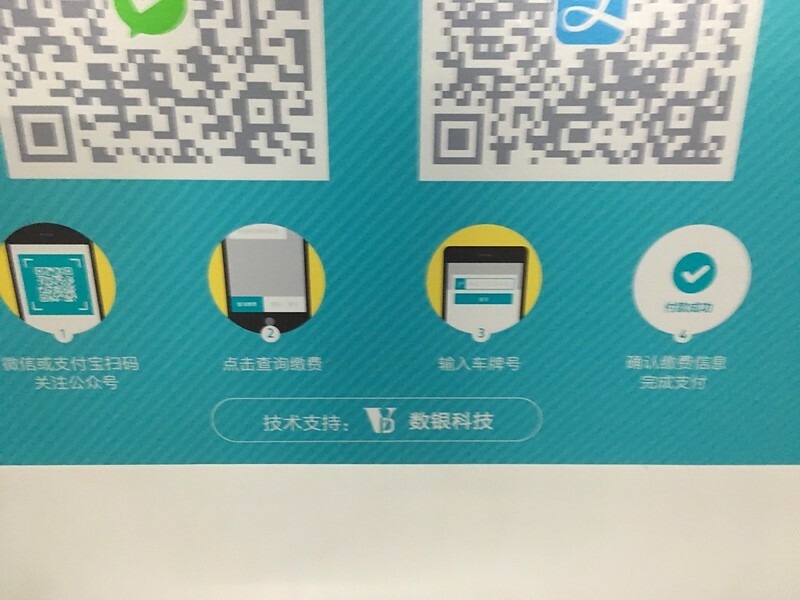 One interesting thing, though, was that when my wife told Japanese friends about how we use mobile payments for everything in Shanghai now, they were surprised and blown away. They had no idea. 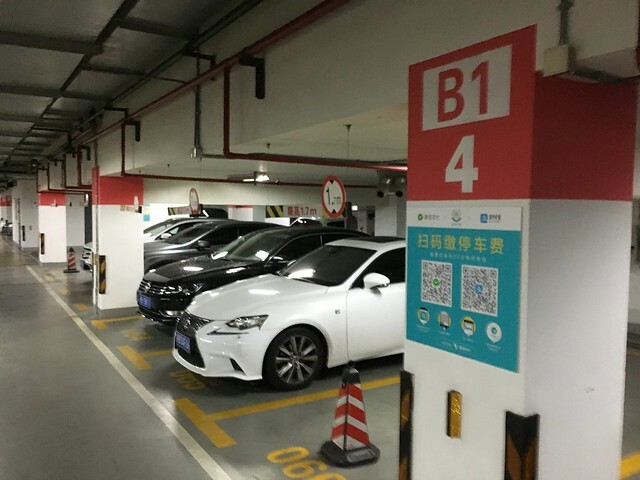 Basically, your license plate gets scanned on the way in, and on the way out you just scan the QR code, input your license plate number, and pay with WeChat or AliPay. The gate opens automatically on your way out. 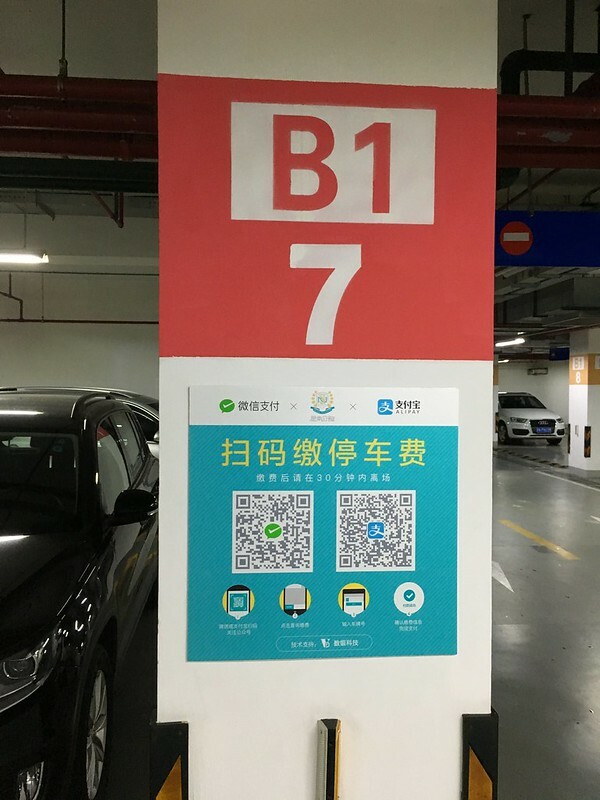 You have to remember to scan the QR code, but these are posted all around the parking garage, and it’s way more convenient then finding a little cashier’s office or paying at a booth at the gate. This same parking garage has “eCars” for rent. 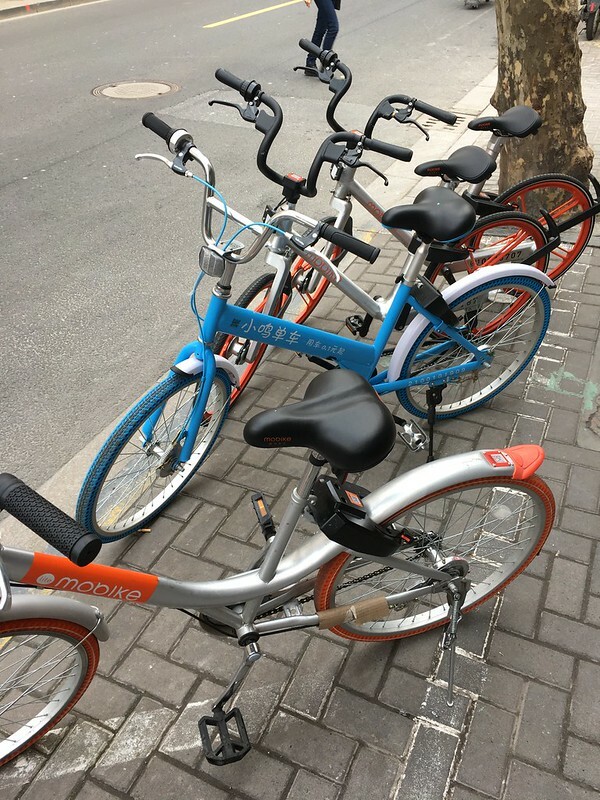 I noticed at the end of 2016 that Mobike seemed to be really taking off in Shanghai. 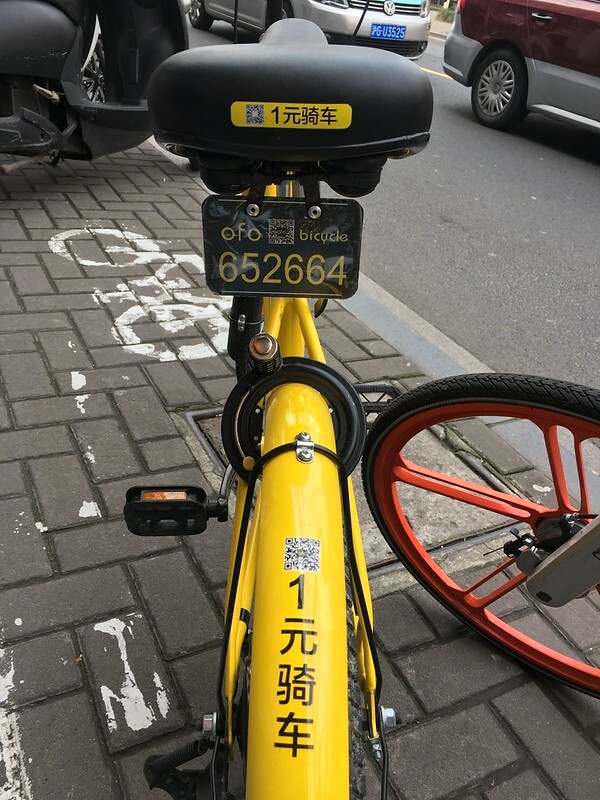 But when I came back from Florida in January, it was a whole ‘nother story… Not only were there more orange Mobike bikes on the streets than ever, but yellow (Didi-backed) competitor Ofo was suddenly seriously competing, and even baby blue 小鸣单车 was upping its game. 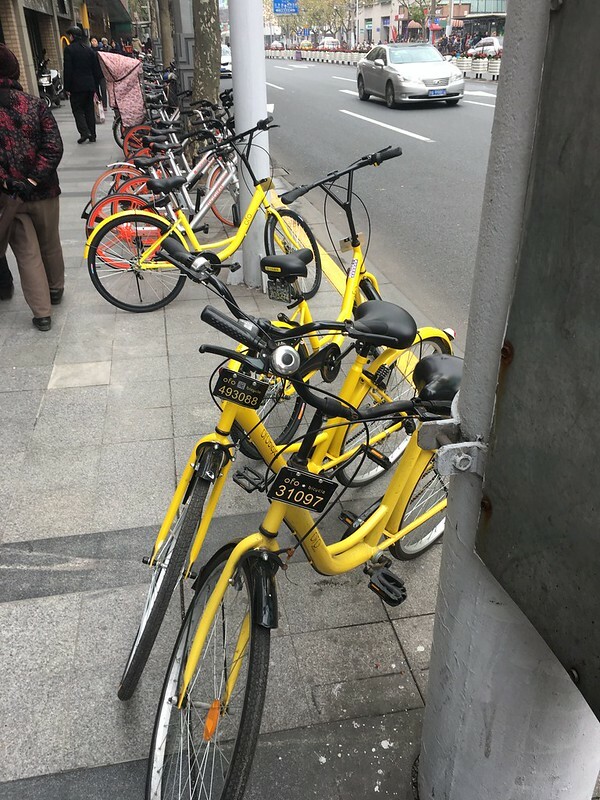 I’ve been seeing so many rows of Mobikes on the sidewalks of Jing’an District that I’m guessing there now must be nightly redistribution efforts going on to properly seed the city center. Now that the Uber war is over, this seems to be the new battlefront. Rise Up and Resist the Motor Scooters! 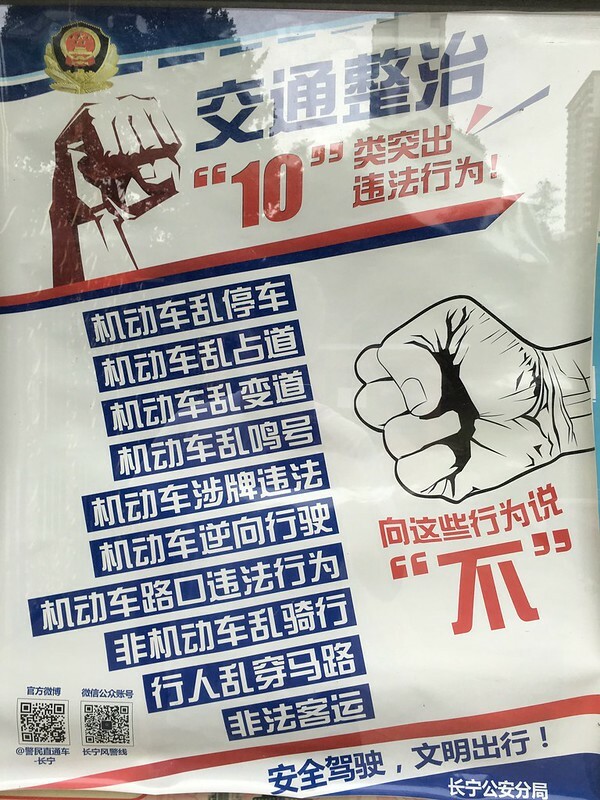 They’re propaganda from the Changning District police department, telling people not to tolerate 10 types of illegal behavior. 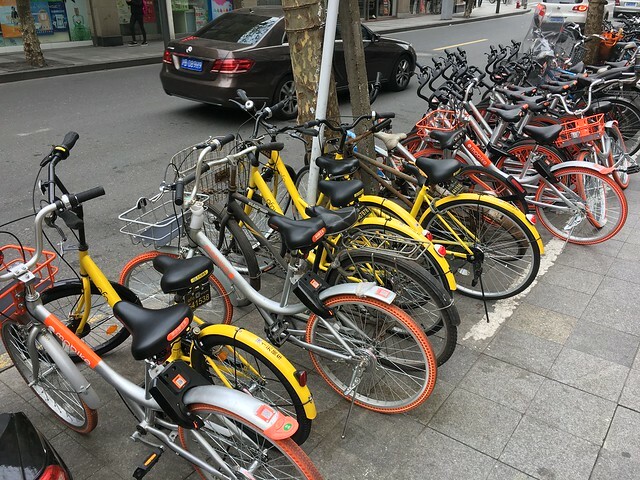 But the first 7 of the 10 items in the list relate specifically to 机动车 (motorized scooters), including illegal parking, blocking lanes of traffic, reckless driving, etc. 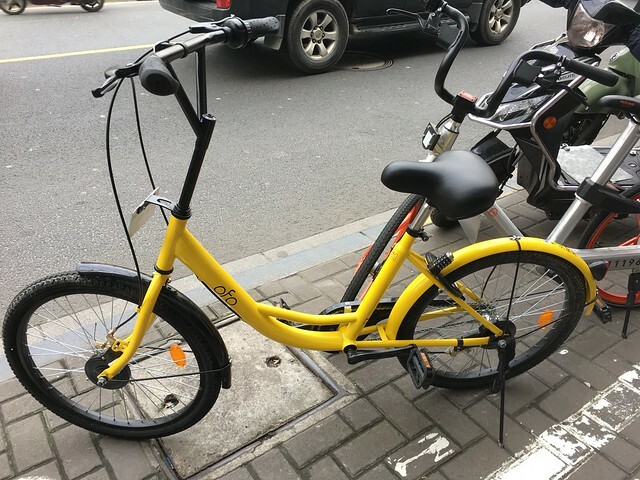 All are extremely common on the streets of Shanghai. 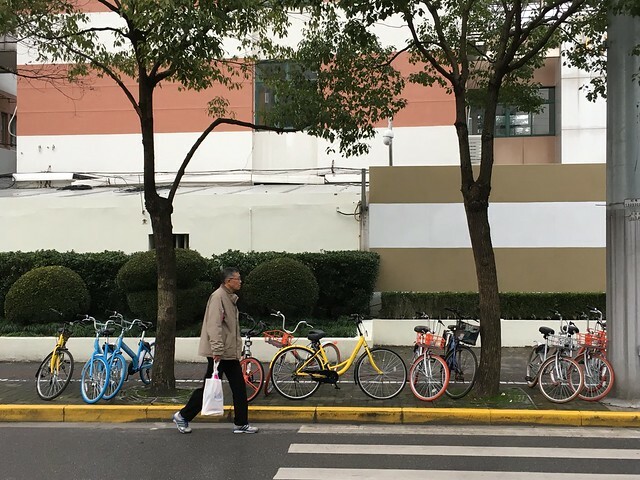 These 机动车 are often blamed for bad accidents, and the drivers of motor scooters can be seen to flagrantly ignore traffic lights and other traffic rules all over Shanghai. The drivers frequently do not even have legal plates. 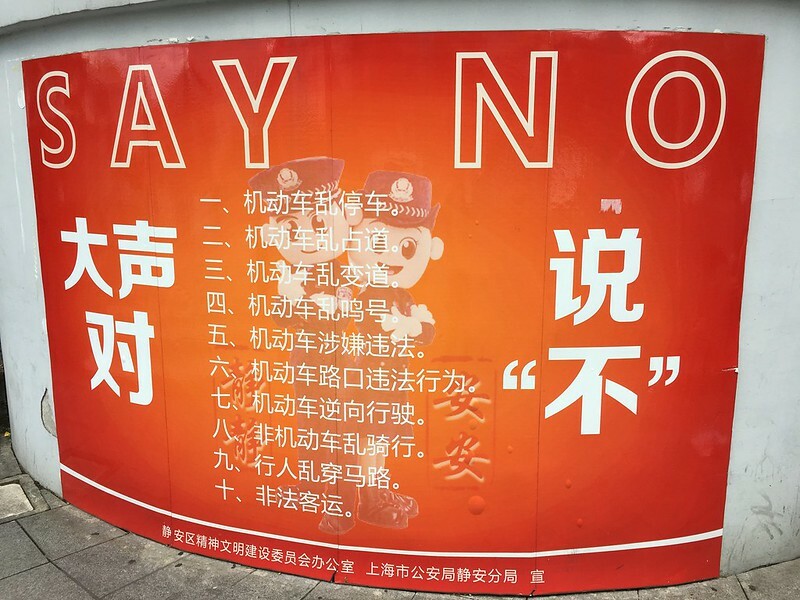 Many in Shanghai (especially drivers of cars, but also pedestrians) have been hoping for a police crackdown for quite a while, but normally very little is done. There are rumors that Shanghai may eventually ban them entirely. I sure wouldn’t mind. 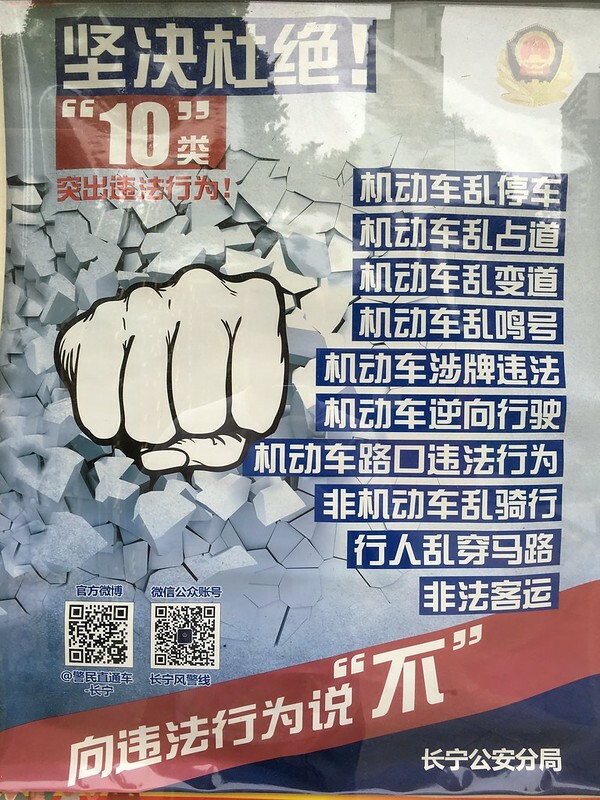 Note: This article originally mistranslated 机动车 as “electric scooter,” when “motorized vehicle” (normally referring to a scooter, not an automobile) is the correct meaning. 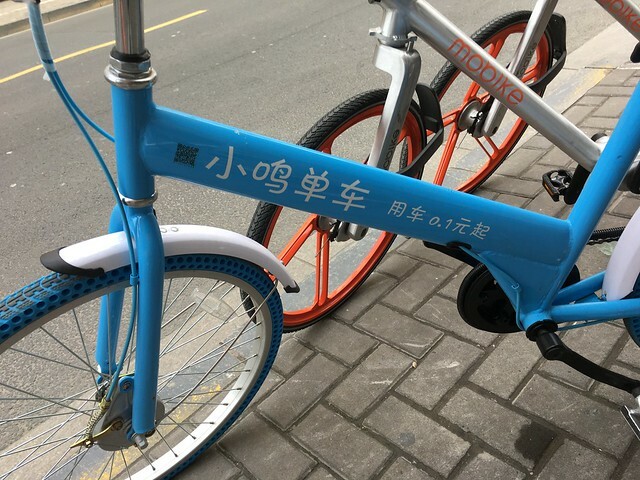 “Electric scooter” would be 电动车 or 电瓶车 (both normally referring to scooters, not electric cars). Thank you to reader E.T. for pointing out this mistake! You can see that two scooters and two people are lying on the pavement. It might look like the people are holding their heads or even writing in pain, but actually they’re both on their phones. Bystanders seem unconcerned for their well-being mostly because the two people on the ground seem totally fine. So why are they lying on the ground like that? 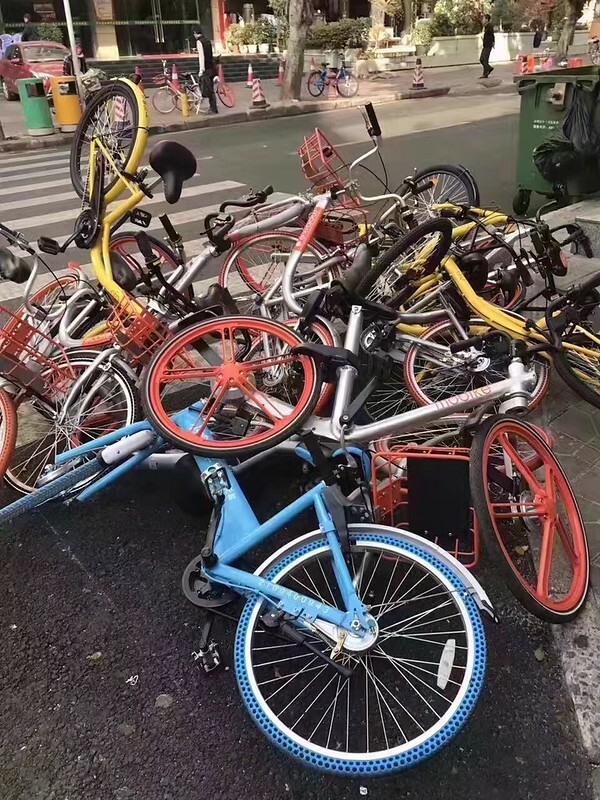 This is standard operating procedure in Shanghai: if you’re on a scooter or a bicycle of any kind and get hit, never get up. Lie there until the police arrive, and make sure that you obtain some kind of compensation to cover your “injury.” Get your cash on the spot, and don’t get up off the street and leave until you get it. This “system” is super annoying, because every little accident results in a much worse traffic jam than necessary. It points to a serious systemic problem, though: this is what the common people feel they have to do. They have to look out for themselves, even if it means lying on the street and faking or exaggerating injuries, because no one else is going to. 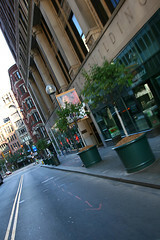 Way back in 2008 or so I used to ride the subway regularly to get to “the factory,” the original ChinesePod office. 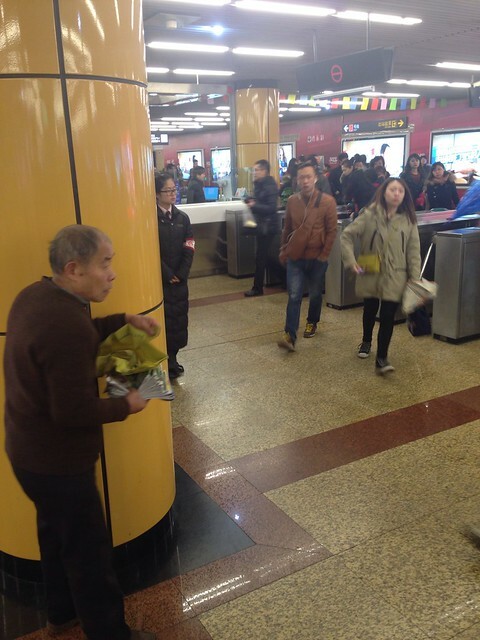 Every day as I got off the subway and exited the station, I’d see these “newspaper recycling people.” They were typically elderly, and they stood by the subway turnstiles, near the garbage cans, busily collecting the used newspapers of all the passengers that were already finished consuming their daily paper-based commute reading. The “newspaper recycling people” accumulated quite a stack of papers every morning. Who needs a newspaper when you have the (censored) sum of the world’s knowledge and entertainment in the palm of your hand? 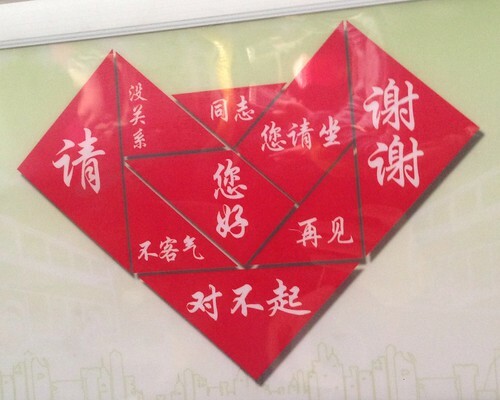 Hopefully these enterprising older people can find a new way to make a few extra kuai. The following photo was snapped in a subway. It’s a public service announcement (or “propaganda poster,” if you prefer) that reminds passengers to be polite. I thought it was kind of interesting to take note of what expressions were chosen to illustrate politeness. This clearly polite word is nevertheless just a little awkward for foreigners trying to speak polite Chinese, because it’s not nearly as ubiquitous as “please” is in English. This word is a bit old-fashioned. It’s also modern slang for a gay person. 您 is the polite form of 你, so this is the politer form of 你好. (It also poses a translation problem… Maybe you come close if you use “hi” for 你好 and “hello” for 您好? The difference is still bigger in Chinese, though.) The expression 您好 also reminds me of customer service reps. I never really thought of this as polite, exactly, but I guess it’s better than taking leave without a word? > Making a left turn just as the light turns green, pulling out before the oncoming traffic. Most people in Pittsburgh allow and encourage this behavior. The past two weeks, I’ve had occasion to visit two different hospitals in Shanghai. Both were large, public hospitals that served a huge volume of patients every day. I came away from both feeling that Chinese train stations and Chinese hospitals are very similar. – Both leave you with a sense of wonder and hopelessness at the magnitude of the problems heaped on a government which has to provide for 1.3 billion people. I learned to drive in high school as a 15-year-old through a driver’s ed class. The only really vivid memory I have of that class occurred in a road test. The instructor was in the passenger seat, and he had his own brake. I was stopped at a red light. When the light turned green, I confidently stepped on the gas. The instructor immediately broke hard, giving me quite a jolt. I glanced up to see that, yes, the light was green. I turned to the instructor, expecting an explanation for his mistake. But no, he was livid. “I’m going straight. The light’s green!” I replied. “No, but the light was green,” I insisted weakly. The key part of the Nudge passage was this: “who come from the United States or Europe.” Drivers from those countries have very rigid expectations for pedestrian behavior. Likewise, traffic patterns are so regular and predictable that pedestrians only really need to look one way when they cross the street, no matter what they supposedly learned in driver’s ed. It’s easy to call traffic in countries like China or Mexico chaotic and uncivilized, and there’s clearly some progress to be made, but isn’t it better for pedestrians to be putting a bit more effort into protecting their lives? Isn’t it better for drivers to be a bit more alert for unpredictable pedestrian behavior? At the very least, I’m pretty sure after living in China, I don’t have to worry too much about crossing the street in London. Life has just gotten way better for me. Last Friday Praxis Language (home of ChinesePod) moved to the Zhongshan Park area (where I live). Why is this a big deal? Well, it means I can walk to work. It’s about more than convenience, though. I used to take the subway to work every morning, and then back home at night. My commute took me down Line 2, through the People’s Square exchange, over to Line 1, at rush hour. Hey, millions of people do this every day in this city, so why shouldn’t I? Well, eventually I learned why. Over time the crushing commuting hordes really got to me. I would start every day lying in bed cursing my alarm clock, dreading my commute, and then, after running the gauntlet again, arrive at work in a foul mood. At the end of the day when work was finally over and I could relax, my bad mood would be reinstated by the commute home. It all added up to a significant amount of unhappiness, far exceeding the daily hour and a half I spent in commute. I tried carpooling, but that didn’t work. Eventually I started taking taxis a lot more. It was kind of expensive, but I learned it was well worth it. I was buying back a pleasant emotional state, and it was a good value. Toward the end, John B and I started carpooling by taxi in the morning and taking the subway home after work. We had to leave a half hour earlier in the morning to ensure that we’d get a taxi every day, but we could split the fare. Totally worth it. Starting Monday I’ll be walking or biking to work every day. It’s going to be sweet. If you’re planning on living in Shanghai and wondering how close to work you want to live, I say VERY.